The Porcelanosa San Francisco, San Jose, West Hollywood, and Anaheim showrooms will be running a spring promotion event from May 11th through May 14th giving clients 25% off storewide. Discount is applied to merchandise and excludes tax and delivery charge. Offer does not apply to fabrication services, previous purchases or already marked down or clearance items. The discount may not be combined with any other offer. 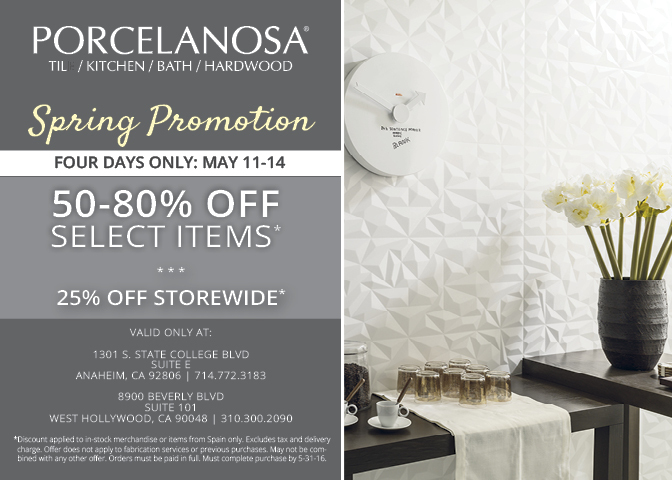 West Hollywood/Anaheim showrooms to receive the discount.